The first impression is very important in both private and business matters. White teeth give you an attractive and confident look. 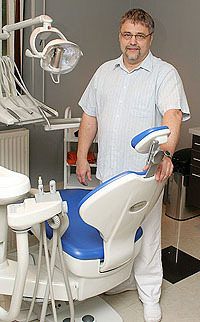 The effect of “home-made” tooth whitening fades rapidly. We, however, use the latest technology for long-term results. In our dental office, we perform tooth whitening with LED lamps, with immediate results. We cover the soft tissue with gum-protecting foam, and then apply a special gel to the area of the tooth to be whitened. Finally, this area is lit with a LED lamp. Three 20-minute treatments are necessary for the best result. By the end of these treatments, the colour of the teeth changes by 4-8 shades, and the effect lasts for 4-5 years, unless the patient is a heavy smoker. In this latter case, the treatment should be repeated after 2-3 years. The best whitening effect can be achieved on living teeth. However, “dead”, root canal-treated teeth can also be whitened. Such teeth are discoloured anyway, even if the colour of the neighbouring teeth remains the same. In this case, we remove the root canal filling and inject the whitening gel into the inside of the tooth as well. Before tooth whitening, defective fillings must be replaced, and any tartar must also be removed. Teeth may also discoloured for genetic reasons. In this case, the results of tooth whitening are not so spectacular, but the colour improves by one or two shades. With advancing age, enamel – which does not regenerate – becomes thinner, leading to tooth discoloration. The teeth of healthy persons are discoloured primarily due to coffee, tea, red whine and cola consumption, and heavy smoking. In the case of non-smokers, professional teeth whitening removes such discoloration for a long time. The effect does not last as long in case of smokers because their teeth are continuously exposed to intense negative effects. Root canal-treated teeth can also be whitened, albeit the process is more cumbersome as the treatment must be performed both on the surface of and within the tooth. Nevertheless, professional whitening in a well-equipped dental office can lead to long-lasting results. Clinical tooth whitening does not damage teeth. As the materials used whiten the teeth via oxidation, they do not damage the tooth tissue. During the treatment, care must be taken to protect soft tissues (gums). For a few days after the treatment, your teeth may be sensitive to cold and heat, and you may experience temporary sensitivity of the area where the teeth and the gums meet. Tooth whitening is not advised to pregnant and breast-feeding women. If you want your teeth to be white at a specific event, it is practical to start the treatments 2-3 weeks before the “big day” so that the temporary problems following teeth whitening do not interfere with your joy at all.